You are hated: Toilethomo in the on-deck circle? I don't mean to brag, but I can spot a toilethomo a mile off. It's just a gift. I'm like Nate Silver, without the Asperger's. 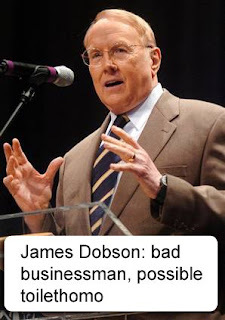 And given his obsession with the gay marriage issue, Focus on the Family's James Dobson will be discovered any day now, kneeling in a toilet and yukkin' on a big boy. But until this fundamentalist meets his inevitable rendezvous with a throbbing faceful of karmic comeuppance, we can ponder this: For the third year in a row, Dobson's Focus on the Family con has had to cut staff. Jimbo's praying so hard for Jesus to help curb his voracious wiener appetite that he let the business slide. C'mon, J-Dawg; the economy is in the shitter. You need to focus.